Argan Oil might sound like a volume killer but we found that it’s really not after using Renewing Argan Oil Shampoo and Conditioner by Organix. It really softens your hair and gives great moisture. 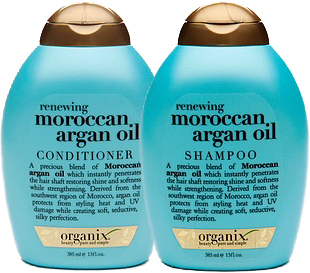 We also liked that as with other Organix shampoos and conditioners, the Moroccan Argan Oil Shampoo and Conditioner are free of sulfates and parabens. 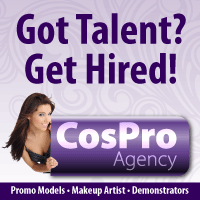 If you have damaged or color-treated hair these are perfect products. We especially liked that when we blow dried our hair we didn’t get that much frizz since our hair was already moisturized. We only wish that the conditioner did more for detangling. 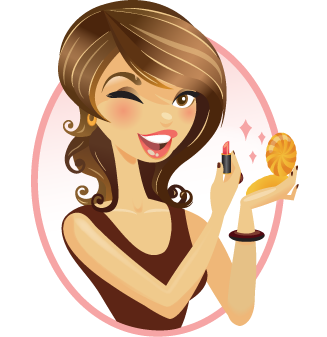 If your hair is very damaged or color processed, the last thing you want to do is wash it with a shampoo that contains sulfates or sodium chorides. 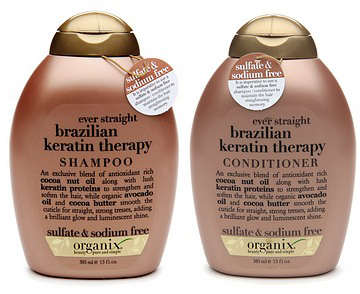 Organix Shampoo and Conditioner – Brazilian Keratin Therapy are not only sulfate and sodium chloride free, they are also very moisturizing. The shampoo and conditioner contain cocoa nut oil, keratin proteins (this keeps your hair frizz free), avocoado oil, and cocoa butter. We were surprised that this formula did not weigh our hair down and love that our hair was frizz free until the next washing. If you absolutely need a lot of lather to feel like you’ve gotten your hair clean, this might not be for you. The shampoo is very mild. 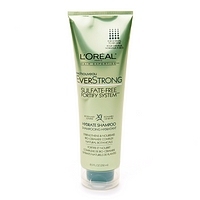 If you’re looking for a sulfate free shampoo that lathers more, try L’Oreal Paris EverStrong Hydrate Shampoo.